Located inside the luxurious Galaxy Macau resort, The Noodle Kitchen is a world-class Chinese restaurant famous for its noodles and dumplings. One of the first things diners will notice when entering the spacious and inviting space is the glass-encased, 14-meter-long kitchen running along one of the walls. With a clear view of the kitchen, customers are able to watch their food being prepared in real-time by the restaurant’s expert chefs. Most of the restaurant’s seats face towards the kitchen, giving diners an unobstructed view of the action. In addition to the traditional seating arrangements, six booths line the back of the restaurant, while a long bench provides seats along the wall opposite the kitchen. Bar-style seating has been placed near the entrance. The color red has long represented good fortune and joy in Chinese culture, and it is prominently used throughout the restaurant. 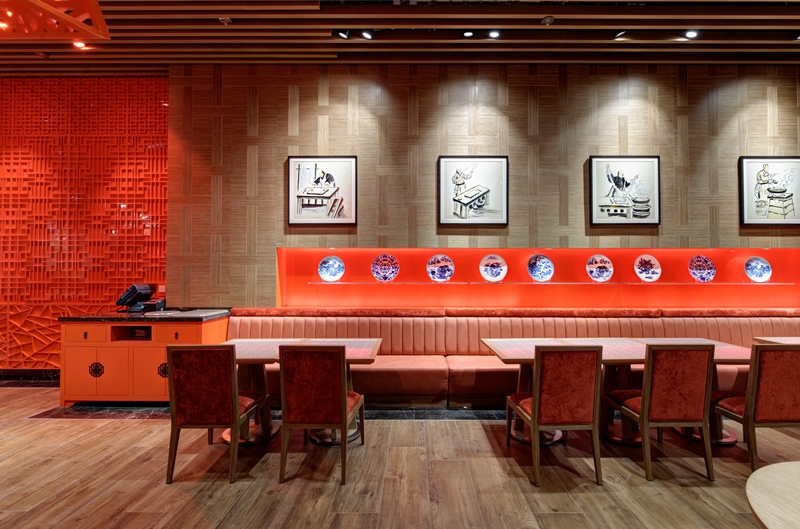 While traditional Chinese decoration has always made use of deep red, here a more orange hue has been chosen in order to give the restaurant a modern look. Some of the more prominent uses of this color can be seen on the restaurant’s central pillar and ventilation shaft, which is adorned on all four sides by traditionally inspired latticework. Taking traditional Chinese designs and giving them a modern twist, the lattices are backlit and mounted above glass and metal panels, creating an eye-catching fusion of both past and present. The use of modern materials isn’t just limited to the central pillar. One of the restaurant’s walls is made almost entirely of glass, giving an otherwise windowless space a sense of depth and making the room seem even larger. In order to create some contrast and keep things interesting, the glass panes are of varying opacity, ranging from opaque to completely clear. Colored panels laid underneath the glass give the room warmth and help incorporate the wall into the restaurant’s color scheme. The overall effect is both arresting and extremely modern. New and interesting uses of traditional Chinese symbols and designs can also be seen elsewhere throughout the space. Chopsticks, one of the most ubiquitous symbols of Chinese cuisine, are used to adorn the show kitchen in the form of supportive beams that frame and complement the glass window panels. Further use of the chopstick motif can be seen on the ceiling, where a chopstick style design has been used to make the ceiling visually interesting and provide a sense of depth. Little touches constantly remind diners that despite the restaurant’s sleek and modern appearance, the food prepared there is part of a long culinary tradition that has existed for thousands of years. Porcelain plates and framed illustrations highlighting the traditional noodle-making process hang above the seating at the back of the restaurant, while various dried goods and cooking tools sit on shelves that run the length of the kitchen. The Noodle Kitchen is a restaurant with one foot planted firmly in the past and the other in the present. In its design, centuries old culinary tradition and design motifs merge with the modern, creating an exciting and visually stimulating mixture of both old and new that will delight customers for years to come. Thanks to PerspectiveGlobal for featuring The Noodle Kitchen project.